The Rebel Sweetheart. : Foodie Goodie | Allegra's Kitchen. Like most kids his age, my son looks forward to weekends with eager anticipation. Because for Yue, weekends not only mean freedom from school work and extended screen time, but also karate training, a trip to the mall, and eating out at his restaurant of choice. 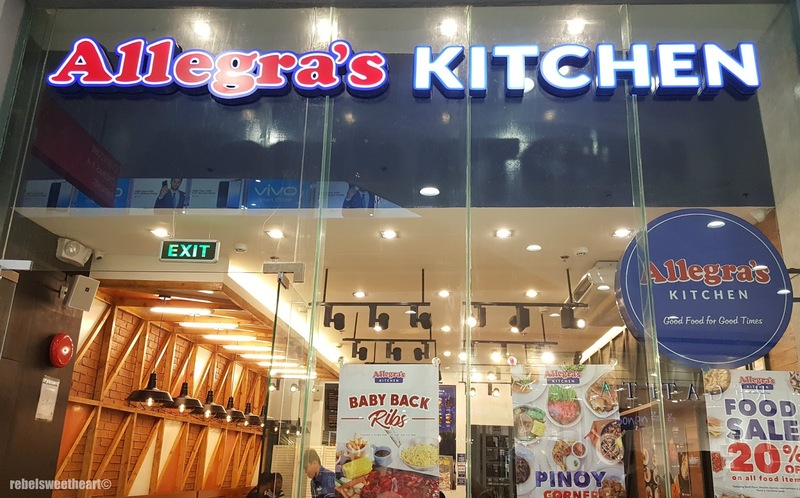 Last weekend, we had the pleasure of dining at Allegra's Kitchen, a fast casual restaurant located at SM City San Pablo. 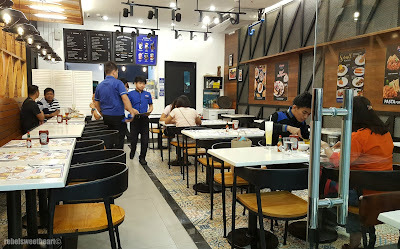 'Fast casual' is a restaurant format which combines the elements of fast food (quick service, self-service) and casual dining (extensive menu, relatively higher price point), hence the term. Allegra's Kitchen, SM City San Pablo. A typical fast casual restaurant has no table service - meaning you place your orders at the counter and pay upfront, wait for your food to be 'assembled', then take them with you to your table. At Allegra's Kitchen, you can place your order directly at the counter, or whilst seated, with the assistance of their friendly staff. A closer look at the restaurant's interior - rustic, western ranch kinda vibe. 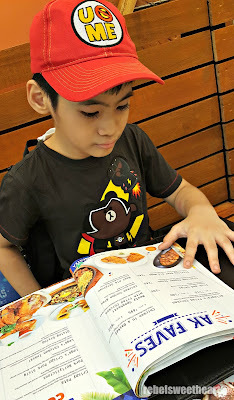 Since this was our first visit, Yue and I took our time flipping through the pages of their menu. Allegra's Kitchen offers just about everything that you would expect from any other casual dining restaurant. They have appetizers, soups and salads, burgers and sandwiches, pasta, and extensive meat options. 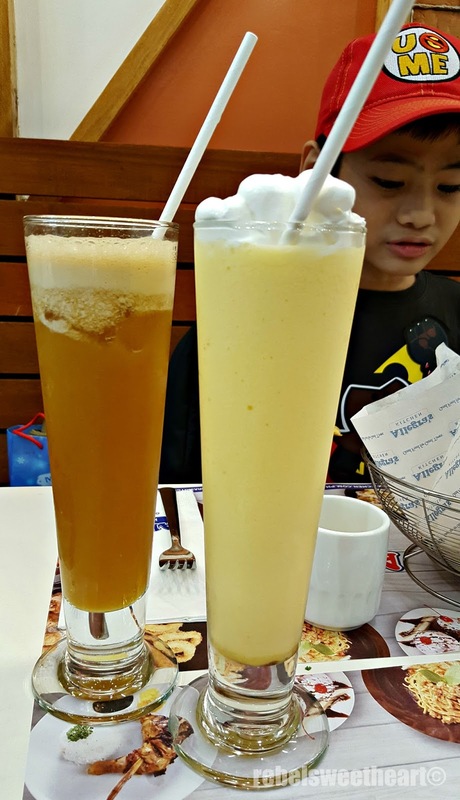 Their beverage line-up includes shakes and smoothies, and even beer and cocktails. Someone's taking good food seriously. 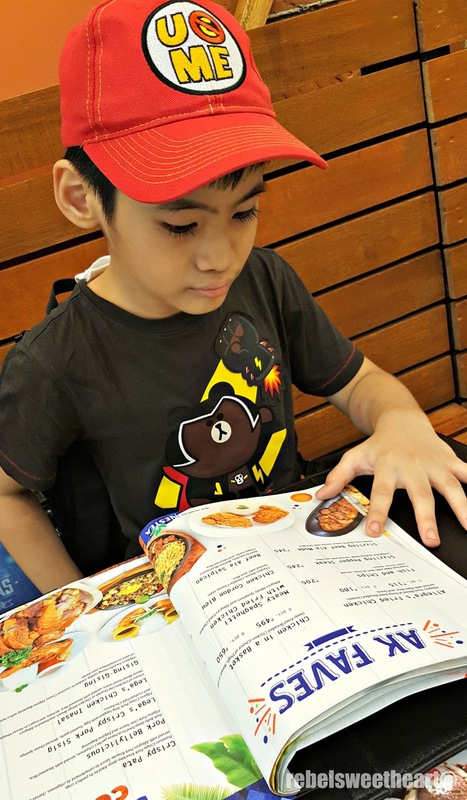 Yue had worked up an appetite after his two-hour karate training and wanted to order like five different items - because he says 'they (the food) all look good in the photos'. Lol! 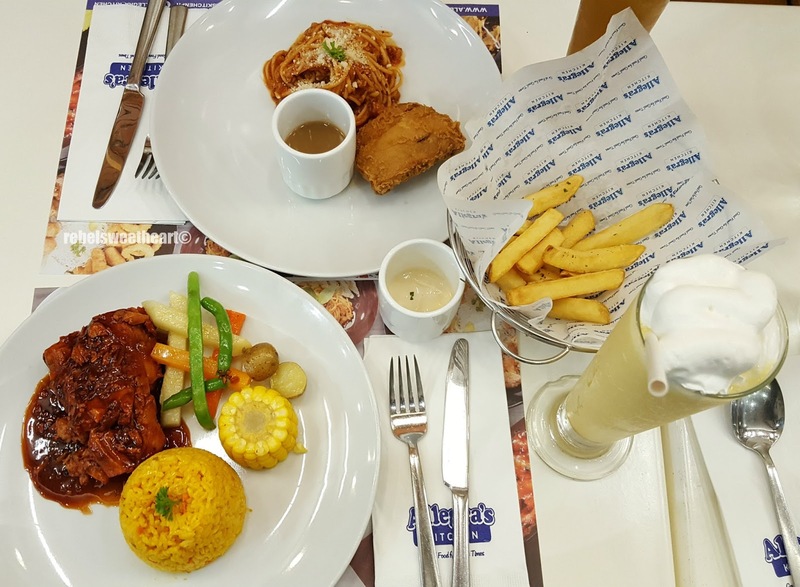 In the end - and just as I expected - he settled for the usual fried chicken and ordered the Meaty Spaghetti with Fried Chicken. The staff informed us that our order would take about fifteen minutes, but surprisingly our food were served in less than ten. 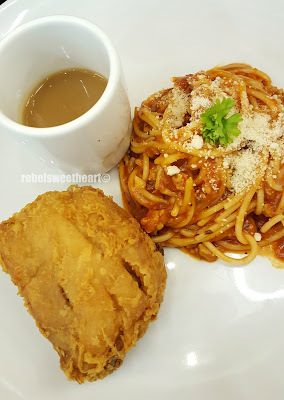 Meaty Spaghetti with Fried Chicken, Php 255. Both the pasta and the chicken had decent portions, enough to satiate Yue's hunger. Allegra's Fried Chicken was cooked the way a fried chicken should be - crispy on the outside, juicy on the inside, and none of that unsightly bleeding. The Meaty Spaghetti - made with ground pork, seasoned sauce, and topped with cheese - had a hint of sweetness which kids love. Skin on Fries, Php 50. Of course, no meal would be complete without fries on the side. Yue and I couldn't find this on the menu so I asked the staff if they serve french fries. Apparently, they do - Skin on Fries. Lovely, crisp, and non-greasy, these hand-cut french fries come with a tangy mayo dip. 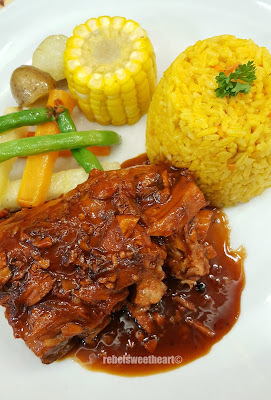 Baby Back Ribs (Single Slab), Php 380. As for me, I had a single slab of the Baby Back Ribs, which the staff claims is the most popular item on the their menu. One bite of this picture-perfect dish and I understood why. The meat had a nice, smoky flavor, was exceptionally tender, and literally fell off the bone. The vegetables were just as yummy - buttered and seasoned nicely, with just the right crunch. However, the sauce was a wee bit salty to my liking, but maybe that's just me as I've been reducing the salt in my food (especially the ones that I cook) ever since I was diagnosed with pre-hypertension. Lega's Iced Tea, Php 75 + Fresh Mango Shake, Php 115. I was stuffed after finishing my plate of Baby Back Ribs, but Yue insisted that he still has room for dessert. 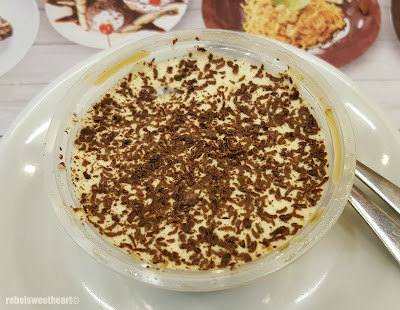 As such, a serving of Tiramisu found its way to our table and into Yue's already bulging tummy, haha! 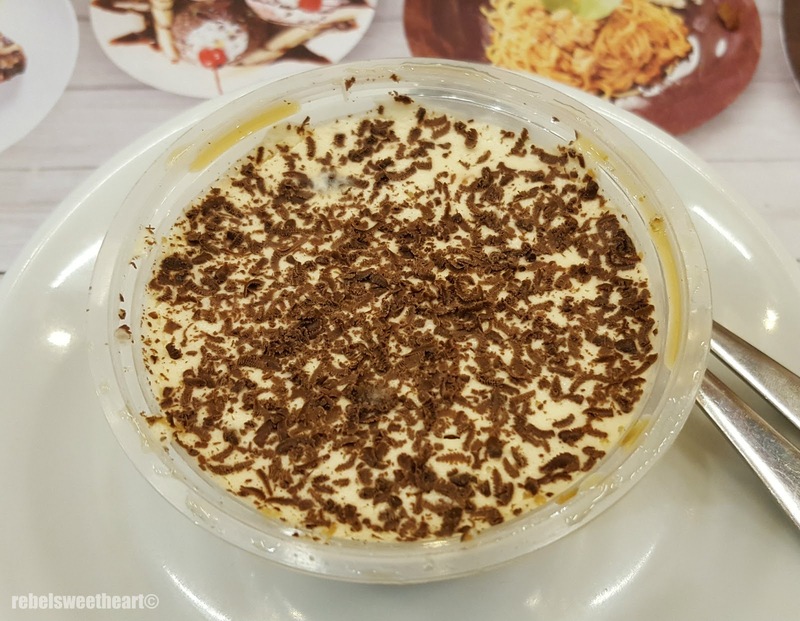 Creamy and not overly sweet, this small tub of tiramisu was the perfect ending to our first Allegra's Kitchen dining experience. Another school week is about to end, and I have a strange feeling that my boy will wheedle me into a subsequent trip to Allegra's Kitchen. Good food for good times at Allegra's Kitchen. Might as well take advantage of their Food Sale - 20% off on all food items! I reckon this promo is ongoing at other AK branches, including the pioneer branch at The Lifestyle Strip in Sto. Tomas, Batangas. Allegra's Kitchen Food Sale, terms and conditions apply. For more information about the Food Sale and the complete menu, visit the Allegra's Kitchen website and their official Facebook page. Thank you for the good time, Allegra's Kitchen! Looks tasty and I'll bet karate really, really works up an appetite for your kiddo! It's great to see families taking the time to share a good meal together. That dessert looks completely amazing! I'm glad you and your son had a great time! This looks like a lovely family restaurant and those iced teas look lovely! I am glad your son had a lovely time. This looks like a great restaurant. I wonder if they have any good vegetarian alternatives. This looks delicious! 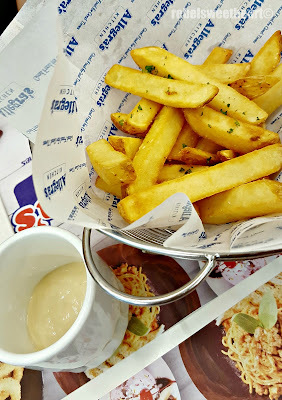 There's nothing better than the fries with the skin - a bit of ranch and it's heaven! This looks delicious! 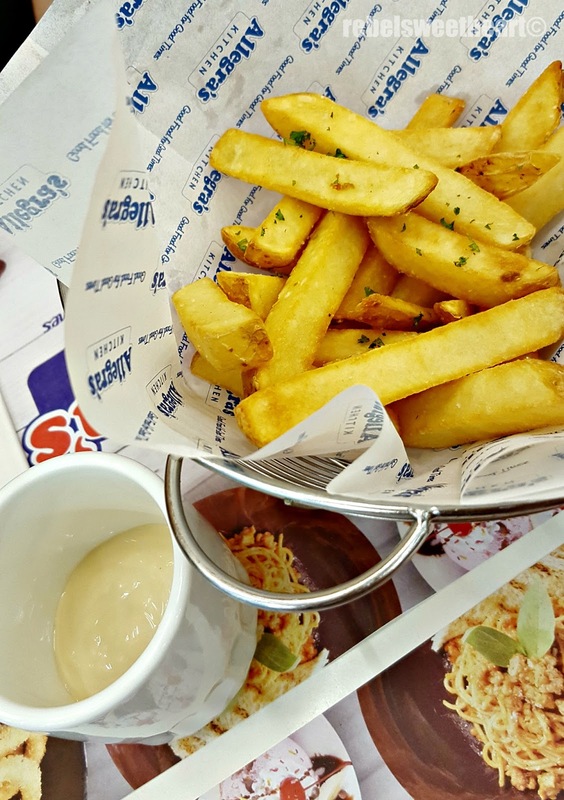 There's nothing better than fries with the skin - a bit of ranch and it's heaven!